Recording Studio Doors | Soundproof Windows, Inc.
Two sliding glass doors are mounted on each side of your recording studio door opening; the recording studio doors can be mounted in a variety of configurations according to your recording studio door opening (see drawings in the recording studio brochure). All of the recording studio door panels are removable, meaning you can use the entire opening to move oversized items such as pianos into the recording studio area easily. These sliding glass doors are available in multi-panel telescoping configurations. This can allow huge opening widths for moving equipment in and out, without removing any door panels. 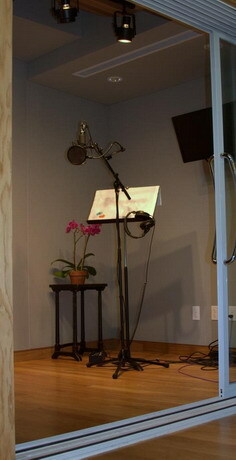 With our recording studio doors, you can now get high STC values, which was not possible previously. Now you can use our recording studio sliding glass doors and get a higher STC than most solid doors. If you mount our recording studio sliding glass door over a swing door (which is possible if the door swings away from the sliding glass door) you can improve the overall STC values and be able to see into the recording studio area until the last minute before recording when you close the swing door. Using two soundproof doors we achieve an STC of 65. Our recording studio brochure details how dramatically our recording studio doors block the low frequencies (45 to 47 decibels at 125 Hz). Example of our recording studio doors installed at MonkMusic Studios (studio designed by John Storyk). 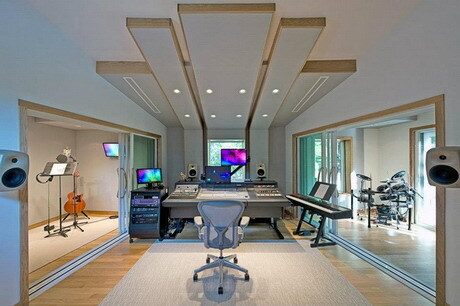 Click on recording studio windows to find out more on soundproofing for your studio.